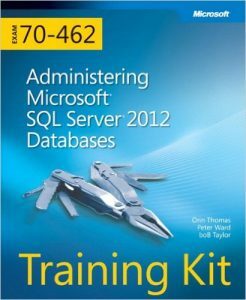 Passing 70-462 gave me confidence to do another and I embarked upon 70-461 (Querying Microsoft SQL Server 2012). I found this easier than 70-462, perhaps due to having more experience in using T-SQL and with a bit of a coding background (at least at university) and passed the exam in February 2014. It followed naturally that with two passes in the bag, I should attempt 70-463 (Implementing a Data Warehouse with SQL Server 2012). This third pass would ensure I gained the MCSA SQL Server 2012 certification. This wasn’t straightforward and took me until March 2015 to pass. Part of the reason for the delay was down to a family tragedy which took away my desire to work towards the certification. The rest was down to the difficulty of the subject matter; with lots of new concepts to learn such as star schemas, I found the subject less intuitive to understand than previous topics. With the MCSA achieved and feeling back into the swing of things, I tackled 70-464 (Developing Microsoft SQL Server Databases) and 70-465 (Designing Database Solutions for Microsoft SQL Server) in quick succession. I passed these in June 2015 and September 2015 to earn the MCSE Data Platform certification. My primary learning methods exams for 70-461 to 70-463 were the Training Kit books from Microsoft Press which accompanied each exam. These books laid out the full syllabus and were very comprehensive. I followed them chapter by chapter, working through the examples on my own development server. I installed a few instances of SQL Server 2014 on a training VM within my company. I downloaded the AdventureWorks2014 and AdventureworksDW2014 database backups from Microsoft and restored the databases onto my instances. This became my playground where I could play around with features and code and was completely isolated from the rest of our Dev environment. This is an ideal place to set up mirroring, replication and Always On Availability Groups. You can also practice writing queries against the Adventureworks database and create your own databases for further experimentation. If you’re fortunate enough to work as part of a team of DBAs and/or developers, it is good to discuss your learning with them. I was fortunate enough to work with an experienced team and whilst the exams always cover new features of SQL Server, they also cover features that go back to previous versions, therefore the experience of colleagues can be very helpful when trying to learn. Our team had a loosely scheduled meeting for 1 hour per week. We tried to stick to it as best as possible and only cancelled it if something urgent needed attention. This was a great place for someone to take a chapter and present on it a well as ask questions of the others. Also, as I moved onto studying for MCSE Data Platform which included new features of SQL Server 2014 as well, I did a presentation to our wider team on new 2014 features including In-Memory OLTP and Natively Compiled Stored Procedures. This included a demo and Q&A session. This process helped me learn because I wanted to do a professional presentation and be able to answer most questions. There comes a point in your learning where you want to start really preparing for exam day. You want to attempt questions that are closer in terms of difficulty and content to the official exam. Authorised practice test are perfect for this. Microsoft now link to a company called MindHub for official practice tests. When I did the exams, they linked to Transcender and MeasureUp. Upon closer inspection, it looks like the MindHub exams are powered by MeasureUp so I expect these are similar content to the MeasureUp ones. It’s important you only use tests from a reputable vendor. If you can’t be sure about the vendor, you can’t be sure you are not using brain dumps. Brain dumps are really bad, they devalue the certifications for those who have honestly earned them. If your motivation is to become a better DBA or developer, they are the last thing you need. How did I benefit from the process? I gained a lot from the process. The new knowledge is obvious and goes without saying. Secondly, my confidence improved as I passed each stage. I began to participate more in conversations between DBAs in my team rather than simply observing. I also took on bigger projects such as large scale database migration and was confident in my ability to plan them out and implement them successfully. I also learned that we did a lot of things right here at Monster. This seemed important to me because I hadn’t been a DBA anywhere else so I had no frame of reference. Finally, it has hopefully made me more employable. Whilst at the time of writing I don’t want to be looking for a new job, I believe it’s important to build your skills as much as possible and to always keep learning new and relevant things. In my opinion, if you take control of your own career, you are less dependent on others. What advice do I have for anyone looking to achieve MCP, MCSA or MCSE? Make sure you are doing it for the right reasons. You want to learn and develop your skills and your career. Get a playground where you are free to make mistakes and start again. Discuss and collaborate – If you have colleagues also working towards the same goal, this can be a good motivation to keep the pace up. Where you have experienced colleagues, use them as much as you can to talk through the various topics. Practice as much as you can using trusted vendors such as MindHub. Set a date. I found that when I had the exam booked, I studied more often and in a more focused way. When I just had the vague objective of passing the next exam with nothing booked, I didn’t get through the material quickly enough or in any organised manner. Remember, you can always rearrange the exam if you are not ready as long as you give the appropriate notice. Please feel free to let me know in the comments if you have other advice for those studying towards a Microsoft certification. A great post John and excellent advice for anyone undertaking the certification route. It’s big commitment to take on learning the subject matter in depth to make you a dba capable of building solution and not just being able to memorise facts to get you through an exam. I see the benefit of your efforts in everything you produce. We’re all very proud of what you have achieved in such a short period of time, the knowledge you have gained has made you an exceptionally valuable member of the DBA team here at monster.